Here is setlist for the August 5, 2017 concert at Holmes Convocation Center in Boone, NC. I thought that the band sounded great and were in high spirits. They did material from each of the first 10 albums (Steve said 9, but count 'em), followed by a three song encore. Dylan Howe handled solo drum duties on some of the earlier material and acquitted himself well, though I thought his kit was initially a little lower in the mix than Alan's. He and Alan both performed on some tunes. Alan handled a few by himself. Clearly, he's still in recovery mode from his back problems, but sounded good. High points of the set list for me were "Survival", "Soon", and "Madrigal." The other tunes have been performed during recent tours, though it's always good to hear them. 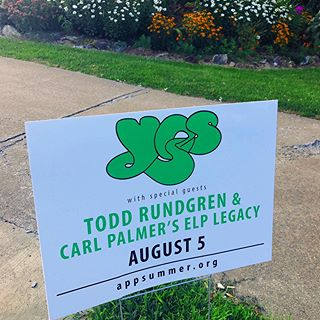 I think YES is hitting on all cylinders and can't wait to see what they have in store for the 50th Anniversary tour (which they promoted at this show)! BTW, Carl Palmer and Todd Rundgren also had exceptionally good sets! Altogether, it was a wonderful evening in Boone.